There is a very similar recipe on here, but it has more eggs and is seasoned a little different. I guess there's many versions of the "impossible" pies! Fry bacon crisp and let drain on paper towels. Meanwhile, finely chop the onion. Grease a regular 9 inch pie plate. 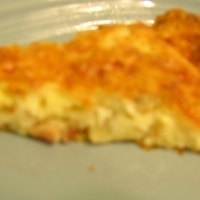 Crumble the bacon into the pie plate., Sprinkle onion over the bacon, then sprinkle the cheese over. In a small bowl, beat the eggs, add milk, biscuit mix, and pepper. Stir these ingredients together until blended, then pour evenly over contents of the pie plate. Let set 5 minutes, then slice into 6-8 wedges and serve. Simply perfect! Glad you posted this, even if there is a similar one, I probably would have never come across it. High 5! Like grandmacooks's recipes? Never miss an upload!